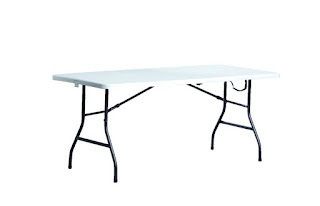 Ace Hardware has for their Rewards Members [free to join]: Living Accents 72"x30" Fold-In-Half Rectangular Table on sale for $29.99 (Price reflected in cart). Store pickup is free if stock permits. Resin tables are great for home and business. Multipurpose tabletop resists water, stains, scratch and impacts. Rubber feet protect the floor. Legs fold in for convenient and easy storage and transportation.